Nothing moves me more, on the way to fetching my mare in the morning, than the sound of her neighing to me as I open the gate. ​Thank you for considering our second chance program for deserving horses! We are seeking individuals who would be willing to adopt a horse into a permanent, loving home. Adoption is hard work, but it also can be one of the most rewarding experiences you'll ever have. It will provide you memories to treasure forever as you experience a lifetime relationship with your new companion. When you adopt a horse, you receive the satisfaction of knowing that because of YOU, another horse is able to receive the love and care it deserves! What's your commitment to a rescue horse? ​Provide feed, exercise, grooming, and most importantly love! 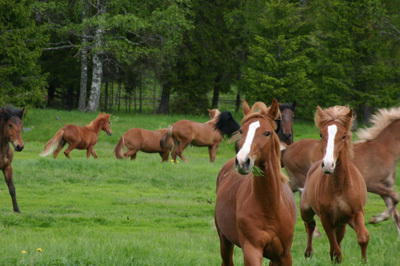 A safe environment is required, comprised of at least one fenced acre per horse. Shelter will be helpful in providing protection and warmth during rainy and cold weather. Appropriate food includes HAY (grass, alfalfa, & mix) and GRAIN (equine feed, oats, pellets, etc.) And of course veterinary and farrier care will also be necessary. Please let us know what kind of horse you are looking for and we will match you with the right one ... or stop by Angel's Grove and you choose! We like to visit the potential adoptive home of each applicant so that we can match the right horse to your property – and your family.